The Church will be raptured in the twinkling of an eye when the seventh trumpet sounds. Then God will judge the Nations. When Jesus comes to redeem the church and judge the nations on the day of the Lord, God will bring with Jesus those who have fallen asleep in him. When the seventh Trumpet sounds, the dead in Christ will rise first and then those who are still alive in Christ and are left will be caught up together with them in the clouds to meet the Lord in the air. They will remain with the Lord forever. 1Concerning the coming of our Lord Jesus Christ and our being gathered to him, we ask you, brothers and sisters, 2not to become easily unsettled or alarmed by the teaching allegedly from us—whether by a prophecy or by word of mouth or by letter—asserting that the day of the Lord has already come. 3Don’t let anyone deceive you in any way, for that day will not come until the rebellion occurs and the man of lawlessnessa is revealed, the man doomed to destruction. 4He will oppose and will exalt himself over everything that is called God or is worshiped, so that he sets himself up in God’s temple, proclaiming himself to be God. 5Don’t you remember that when I was with you I used to tell you these things? 6And now you know what is holding him back, so that he may be revealed at the proper time. 7For the secret power of lawlessness is already at work; but the one who now holds it back will continue to do so till he is taken out of the way. 8And then the lawless one will be revealed, whom the Lord Jesus will overthrow with the breath of his mouth and destroy by the splendor of his coming. 9The coming of the lawless one will be in accordance with how Satan works. He will use all sorts of displays of power through signs and wonders that serve the lie, 10and all the ways that wickedness deceives those who are perishing. They perish because they refused to love the truth and so be saved. 11For this reason God sends them a powerful delusion so that they will believe the lie 12and so that all will be condemned who have not believed the truth but have delighted in wickedness. Jesus will overthrow the Man of Lawlessness with the breath of his mouth and destroy him by the splendor of his coming . This is very similar to Revelation Chapter 19 where Christ leading the Armies of Heaven defeats the beast and strikes down the Nations with a sword that proceeds out of his mouth. 51Listen, I tell you a mystery: We will not all sleep, but we will all be changed— 52in a flash, in the twinkling of an eye, at the last trumpet. For the trumpet will sound, the dead will be raised imperishable, and we will be changed. 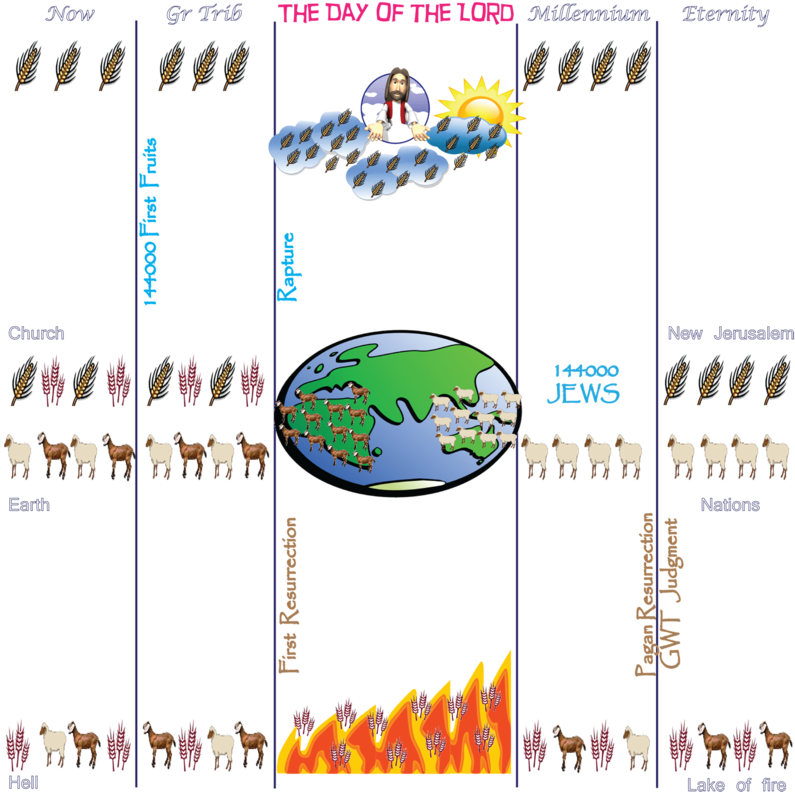 The first resurrection and the rapture occur at the Last Trumpet. It will happen in the a flash, in the twinkling of an eye. When the Seventh Trumpet sounds, the dead in Christ will be raised and those in Christ who are living at the time will be transfigured. We will meet with Christ in the Clouds. There will be a wedding. Christ will reward the believers for what they have done. The believers will then accompany Christ when he comes on the Day of the Lord to defeat the beast and the false prophet and judge the Nations at the Battle of Armageddon. Enoch, the seventh from Adam, prophesied about them: “See, the Lord is coming with thousands upon thousands of his holy ones to judge everyone, and to convict all of them of all the ungodly acts they have committed in their ungodliness, and of all the defiant words ungodly sinners have spoken against him.” These people are grumblers and faultfinders; they follow their own evil desires; they boast about themselves and flatter others for their own advantage. When the Lord comes to judge the Ungodly, (the Nations) he will bring with him thousands upon thousands of his holy ones (who were raptured or resurrected shortly beforehand). 9After this I looked, and there before me was a great multitude that no one could count, from every nation, tribe, people and language, standing before the throne and before the Lamb. They were wearing white robes and were holding palm branches in their hands. 10And they cried out in a loud voice: “Salvation belongs to our God, who sits on the throne, and to the Lamb.” 11All the angels were standing around the throne and around the elders and the four living creatures. They fell down on their faces before the throne and worshiped God, 12saying: “Amen! Praise and glory and wisdom and thanks and honor and power and strength be to our God for ever and ever. Amen!” 13Then one of the elders asked me, “These in white robes—who are they, and where did they come from?” 14I answered, “Sir, you know.” And he said, “These are they who have come out of the great tribulation; they have washed their robes and made them white in the blood of the Lamb. 15Therefore,“they are before the throne of God and serve him day and night in his temple; and he who sits on the throne will shelter them with his presence. 16‘Never again will they hunger; never again will they thirst. The sun will not beat down on them,’ nor any scorching heat.17For the Lamb at the center of the throne will be their shepherd; ‘he will lead them to springs of living water.’ ‘And God will wipe away every tear from their eyes.’ ” 8:1When he opened the seventh seal, there was silence in heaven for about half an hour. The Seventh Seal differs from the other seals in that the events associated with it precede the mentioning of it. This is also the case with the seventh Trumpet. 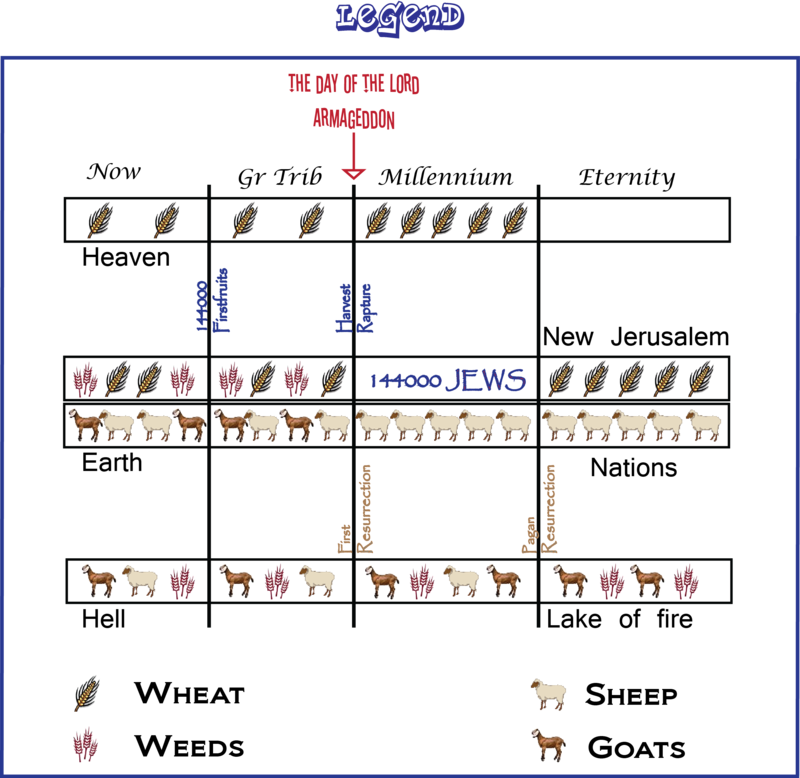 The sealing of the 144000 Jews and the rapture of the Great Multitude are, therefore, linked to the seventh seal. It is quite fitting that the Rapture of the Church should immediately follow the opening of the seventh and last seal on the scroll that the Lamb is opening. The scroll is none other than the Book of Life (or a chapter there of). When the Book is opened, the names of those who are Born Again are known. The Sons of God are thus revealed and the angels immediately set about raising them from the dead or redeeming them from the Earth. 15The seventh angel sounded his trumpet, and there were loud voices in heaven, which said: “The kingdom of the world has become the kingdom of our Lord and of his Messiah, and he will reign for ever and ever.” 16And the twenty-four elders, who were seated on their thrones before God, fell on their faces and worshiped God, 17saying: “We give thanks to you, Lord God Almighty, the One who is and who was, because you have taken your great power and have begun to reign. 18The nations were angry, and your wrath has come. The time has come for judging the dead, and for rewarding your servants the prophets and your people who revere your name, both great and small—and for destroying those who destroy the earth.” 19Then God’s temple in heaven was opened, and within his temple was seen the ark of his covenant. And there came flashes of lightning, rumblings, peals of thunder, an earthquake and a severe hailstorm. The Seventh Trumpet is the Last Trumpet to sound. It is when Christ returns to redeem the Church and judge the Nations. It is also associated with the opening of the Little Scroll which is the Book of Life (or a part there of). The Second coming of Christ to Redeem the Church and Judge the Nations corresponds to the opening of the Seventh Seal and the Sounding of the Seventh Trumpet. The ten horns you saw are ten kings who have not yet received a kingdom, but who for one hour will receive authority as kings along with the beast. They have one purpose and will give their power and authority to the beast. They will wage war against the Lamb, but the Lamb will triumph over them because he is Lord of lords and King of kings—and with him will be his called, chosen and faithful followers. When Christ comes to judge the Nations, he will have with him his called, chosen and faithful followers (who were raptured or resurrected to be with Christ shortly before this).